SANAA, 16 August 2009 (IRIN) – Water and sanitation companies in Yemen are adopting unprecedented water rationing in major cities including the capital Sanaa, Taiz, Mukalla, al-Beidha, al-Dhalea and Lahj, local council officials said. Urgent action is needed to halt depletion of the country’s water resources, Abdulqader Hanash, deputy minister for water affairs, told IRIN. Some 90 percent of available water is used for agriculture, leaving just 10 percent for industrial and household use, he said. Specialists have said before that 40 percent of Yemen’s agricultural water consumption can be attributed to the cultivation of Qat – a mild narcotic plant. Hanash explained that the ministry was taking steps to stop the proliferation of wells which exacerbated groundwater depletion; it was also helping citizens to switch to less water-dependent produce and farming techniques. “We expect the international community and donors to provide further funding to allow the ministry to implement its water strategies,” he added. A report by the UN Economic and Social Commission for Western Asia (UN-ESCWA) says Yemen is under “serious water stress”. The World Bank considers a country to be water scarce if there are less than 1,000 m³ of renewable internal freshwater resources available per capita. The global average is about 6,750 m³ of water per capita. All Arab countries bar Lebanon and Comoros are well below the water scarcity level. Yemen has about 200 m³ per capita – just 3 percent of the global average. A UN Development Programme (UNDP) study of Arab countries in 2007 said Yemen had the second highest percentage of population without access to safe water (after Comoros) – 33 percent – just over double the Arab average. Environmental specialist Mohammed al-Ariqi said Yemen’s water deficit was growing at 5 percent per year – the same rate as annual population growth. A new water source has been discovered recently in Hadhramaut but its impact on the country’s overall water needs has not yet been assessed. In al-Ariqi’s book Water: Reality & Vision, al-Ariqi said Yemen’s water deficit in 2000 was 900 million m³; 700 million m³ in 1995; and 400 million m³ in 1990. His latest figures, for 2005, put the country’s water deficit at 1.28 billion m³. Al-Beidha, with a population of 300,000, is the country’s most water-scare province, according to Mohammed al-Aidarous, a local councillor there. Water in al-Beidha costs more because it takes three to four hours to transport it by truck from the nearest water source. “The majority of the province’s artesian wells have dried up because of frequent droughts coupled with excessive consumption by farmers growing qat,” he said. Abdulwahab Almujahed, head of water and environment at the Social Fund for Development, said that Taiz city suffers the worst water shortages in the country with citizens receiving municipal water once every 45 days on average. Compounding the shortages problem was the fact that having long intervals without water running through the pipes causes contamination, he said. Almujahed added that Dhamar, 100km south of Sanaa and with a population of nearly 120,000, has the cleanest water supply in Yemen because it is available almost every day. To get a large truck-load of water (3,600 litres) delivered in Sanaa has gone up in the past month from US$7.5 to US$12.5, according to Abdulkarim Al-Ghashm, an employee at the Ministry of Industry and Trade. Mahdi al-Sukhaini, owner of an artesian well near al-Saleh mosque in Sanaa, attributed the problem to severe drought: “Many artesian wells have dried up,” he told IRIN. He also complained of a lack of fairness in the water rationing system, with some parts of Sanaa not getting water for up to 15-20 days at a time. He said the company was looking at ways of alleviating the situation: the digging of 1,000-metre deep wells around the city, desalination projects in the Red Sea, and tapping into new water sources in the Empty Quarter. The main problem in all cases was lack of funding, he said. “Thirty years ago water was found in the Sanaa basin at a depth of 20-30 metres, but now we have to go down 300-400 metres,” al-Kharbi said, warning that Sanaa could run out of water in the next 15-20 years. According to al-Kharbi, only 52 percent of Sanaa’s two million people are connected to the municipal water supply network. KAMPALA, 3 November 2008 (IRIN) – Agatha Locham, 23, sits with her two weak and malnourished children a few steps from the entrance to a bank in Kampala. 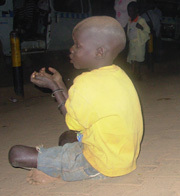 “Mpayo ekikumi [give me a 100-shilling coin],” the boy, his stomach distended, shouts at passers-by. Locham and her children are among the increasing number of residents of the drought-prone region of Karamoja, north-eastern Uganda, who have travelled hundreds of kilometres to the city to beg to survive. She said her malnourished child was weak because they had not had a decent meal in days. Locham declined to reveal how much they made in a day, saying only that it was sufficient for a room in Kisenyi slum. Up to 30 people live in rooms meant for five in Kisenyi, with children charged 100 shillings (five US cents) while adults pay 300 shillings (15 cents) per night. Pune, September 12 – It is the scarcity of drinking water resources that is causing people to migrate from rural parts of the state, especially the drought-prone regions, said Richard Mahapatra of Wateraid India on the sidelines of the first consultation meeting for preparation of the Citizens’ Report on Domestic Water and Sanitation. “It is not so much the lack of water for irrigation. If people lose crops, they can still depend on public wage schemes like NREGS, but if they do not have drinking water, they cannot get a water bottle,” said Mahapatra. Water Aid has been collaborating with over 220 citizens’ groups across the country and over 10 groups attended the first meeting today, where groups pointed to the existing network and lacunae in promoting equitable water accessibility. The Citizens’ Report, which is expected by December 2009, will highlight domestic water, sanitation and hygiene related issues from the citizens’ point of view.